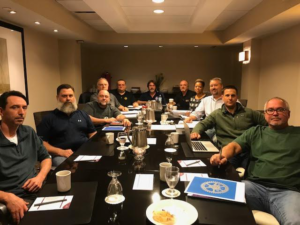 The Union Coordinated Bargaining Committee (CBC), main table coalition, recently met with GE Company Officials in Cincinnati, Ohio in a Pre-Negotiations benefits and business update. 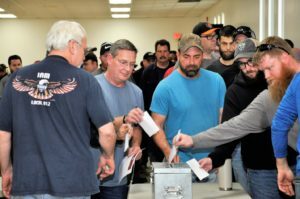 Union discussions were led by President and CBC Chairman Carl Kennebrew and IUE-CWA Conference Board Chairman Jerry Carney, while Paul Lalli, Head of Union Negotiations for GE, led the company delegation. Company representatives provided presentations and discussions on topics such as Active Healthcare, Retirement Income, and Wages & Overtime to include other related benefits. In addition to the above benefits, GE Overview and Business updates were presented for Aviation, Healthcare, and Power sectors of the business. It was stated that this is challenging times for the GE Company, referencing the decline of stock price from 2015 to 2018. The company said during these challenging times, competitiveness and managing cost are paramount for the future of GE and its employees. They stated that cuts at the executive level have been made, and structures have been changed, to move the company balance sheet in the right direction. In 2018 GE’s new CEO signed compensation package of up to $21 Million a year in salary, bonuses and stock for the next four years. In 2019 the CEO will receive an annual salary of 2.5 million, with a bonus of about $3.75 million along with equity awards valued at $15 million. While GE’s lead negotiator says that there is a long and proud history of GE working collaboratively together with their labor unions, we need to walk away with a contract that is fair to our employees. Your Union CBC main table negotiators will be meeting April 16, 17, 2019, in Dayton, Ohio to continue to prepare for the official start of negotiations in June 2019. The Healthcare CBC subcommittee will be meeting on April 10-12, 2019 for continued work on the proposals. 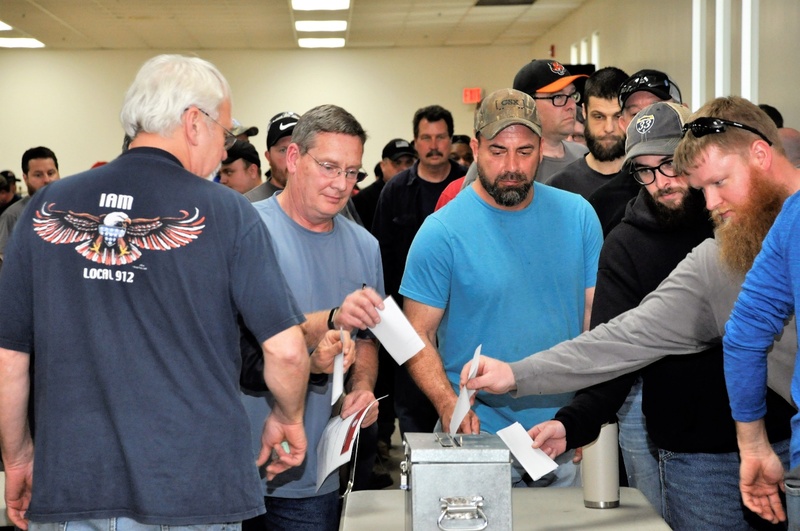 The General Electric Coordinated Bargaining Committee (CBC) recently met in Lynn, Massachusetts, a meeting hotsed by IUE-CWA Local 201. All committee members were provided a tour of the Lynn GE Facility. Discussions were led by IUE-CWA Acting Conference Board Chairman and Lead Negotiator Jerry Carney and topics included committee structure, future timeline for negotiations, and upcoming negotiation preparation meetings. Discussions were also held on the current environment over wage structures, financial report on the current CBC finances, and pitchouts on contract language, health care and retirement. IUE-CWA President Carl Kennebrew provided an update on the progress and commended the negotiation committee on the achievements made in preparing the proposals. President Kennebrew also praised the vision of the committee for formulating a negotiation package on behalf of the membership’s voice. A contract negotiation communications plan was presented and discussed with the negotiation committee. The Main table negotiation committee will be meeting with GE Company Official for a benefits update on April 2-3, 2019 in Cincinnati, OH. The Healthcare CBC subcommittee will be meeting on April 10-12, 2019 for continued work on the proposals. The full CBC Steering committee meets in at IUE-CWA Headquarters in Dayton, Ohio April 15-17 to review the work of the subcommittees and put together final demand documents. The entire General Electric Coordinated Bargaining Committee (CBC), a coalition of 11 unions led by IUE-CWA President Carl Kennebrew, recently came together to tour the Evendale GE Facility in Cincinnati, discuss upcoming negotiations, and establish subcommittees. CBC Chairman/IUE-CWA President Carl Kennebrew set the foundation and provided the vision for the negotiations scheduled to start in June 2019, and IUE-CWA Acting Conference Board Chairman and Lead Negotiator Jerry Carney oversaw the subcommittee meetings. Bargaining subcommittees and chairs were named during this gathering. The chairs named included IAM Collective Bargaining Director Craig Norman (Retirement Chair) and UAW Representative Gary Jordan (Health and Welfare Chair). IUE-CWA Acting Conference Board Chairman Jerry Carney will also act as the Language and Wage subcommittee Chair. All the unions of the CBC will make sure their members’ concerns are addressed, and the CBC will work hard to secure an agreement that makes life better for the members and their families. The GE Bargaining Committee’s Health and Welfare subcommittee also met on February 19 at the UAW Solidarity House in Detroit to work on proposals for upcoming negotiations in June. The CBC main table committee and subcommittees are scheduled to meet again on March 11, 2019, in Lynn, MA to continue the work on preparing proposals and tour the GE Lynn facility.